Large or small, CircuPool has a salt chlorine generator that can handle the job of creating a more enjoyable experience for your pool. 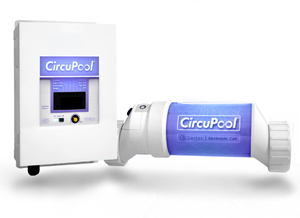 A CircuPool salt chlorine generator will instantly have a positive effect on your pool that users will enjoy. With a CircuPool salt chlorine generator, your pool will go from average to extraordinary with just the flip of a switch. All CircuPool systems come with complete instructions and many homeowners elect to perform the easy, one-hour installation themselves.